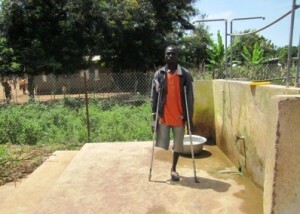 Abdulai Ibrahim lost his leg during an accident several years ago. Like many disabled persons in Ghana, Mr. Ibrahim could have been forced to beg on the street or depend on his extended family members for support. Instead, he opted to fend for himself through an innovative multiple use of water system. Mr. Ibrahim, 40 years old, pictured below is a member of the water, sanitation and hygiene (WASH) committee in Bulenga, a community located in the Wa East District of the Upper West Region of Ghana. 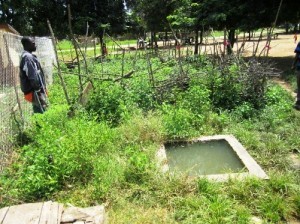 Bulenga community has a mechanized well that supplies water to an elevated tank where water flows out under gravity to 4 stand pipes at a central point. In order to collect a small fee to cover operation and maintenance cost, Mr. Ibrahim was tasked by the community and the WASH committee to be at the pipe stands to collect the money as people fetch the water. “Out of the money I collect each day, I am given GHC 2/day (two-Ghana cedis/day, US$1=GHC1.45)”. This works out to GHC 60/month which is the average salary an unskilled worker earns/month. Having sat down to reflect on what could be done with the extra water that overflows from the taps during the process of fetching, Mr. Ibrahim collected the waste water into a sump (see picture below) that he uses for gardening. He claims he makes GHC 5 per market day sales which come every 3 days. From his total earnings, he is likely to make GHC 110 per month. Asked if there was anything he thought could be conveyed to the world, he responded that “let others know that we can eradicate poverty using the waste water from the water source”. Besides as a disabled man, “I don’t rely on any extended family member for my daily bread”.